MormonInfo.org - FAQs - How can Jesus be one Being with the Father when Jesus prays to the Father? The problem here is that LDS set up a straw man that no legitimate Christian church holds to; LDS easily destroy that, and then think they are justified in dismissing traditional Christianity. This is simply due to a failure in really understanding what the doctrine of the Trinity teaches. These LDS arguments don't dismiss traditional Christianity at all. Rather, they are problems for those like United Pentecostals (not all Pentecostals are United Pentecostals) or Apostolics who hold to the heresy called Modalism that traditional Christianity condemned many centuries ago. Modalism teaches that the Father is the same person as the Son, the Son is the same person as the Holy Spirit, and that the Holy Spirit is the same person as the Father. The terms "Father," "Son," and "Holy Spirit" are simply titles or ways of appearing, but they all refer to the only Person of God there is. It is like saying, "The Evening Star is the Morning Star." Astronomers used to think these were actually two separate stars. Now they realize that they are in fact the same star, viz., Venus. The Mormon understanding of the Godhead flatly goes against Modalism. Mormonism teaches that the terms "Father," "Son," and "Holy Spirit" refer to three separate individuals, each of who had to become a god at some point, and they are only one in their purpose as well as their human nature. Now traditional Christianity goes against both Modalism as well as Mormonism on the doctrine of the Trinity. Traditional Christianity disagrees with Modalism, and agrees with Mormonism that the terms "Father," "Son," and "Holy Spirit" refer to different persons. But traditional Christianity disagrees with Mormonism, and agrees with Modalism that the terms "Father," "Son," and "Holy Spirit" refer to only one God in their Being. 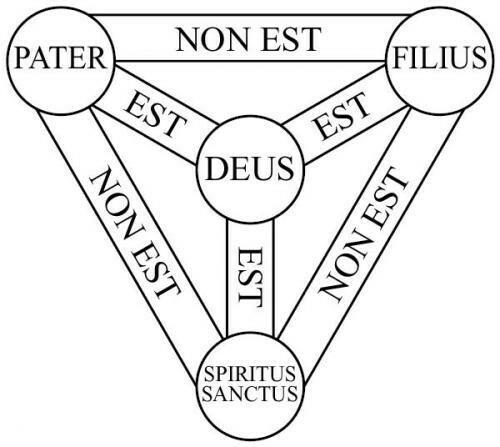 So traditional Christianity holds that within the nature of the only Being of God there is, there forever exists three different, albeit inseparable, Persons--Father, Son, and Holy Spirit. Perhaps the problem is Christ's obvious human nature. This was and certainly is distinct from God (Jesus was born, grew, and died similar to other separate human beings), and so LDS latch onto this as a reason why the Son of God must be a separate being from God. Yet all this proves is that Christ's human nature is distinct from God. It is another thing for LDS to prove that Christ did not have a human nature wired to a divine nature, which is inseparable from the other Divine Members (cf. my comments on John 10:34 and 17:21-23). If Christ in fact eternally had a divine nature, then we must accept that He is one Being with the Father and the Holy Spirit since the Bible is quite clear that there is only one Being who Created literally everything outside Himself. For more information, see my video lecture on Mormonism and the Trinity.